PS-SPEC is an all-inclusive software program for consulting engineers, contractors, and other professionals involved in the design, application load analysis and installation of generator sets. MTU Onsite Energy has created a powerful new version of its PS-SPEC sizing software that now enables users to select generator sets for projects of any size and produce precise specifications. 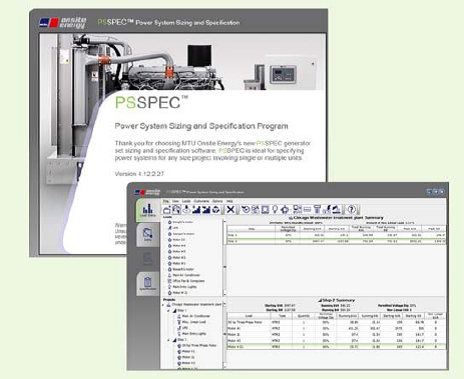 Available as a free download from the MTU Onsite Energy website, PS-SPEC is a complete generator sizing program with an intuitive graphic user interface and extensive step-by-step help files. If you are already using PS-SPEC, you will be prompted to update to the latest version the next time you log in to PS-SPEC. If you are not already using PS-SPEC, the updated software is available at the MTU Onsite Energy website. Important: You must be registered before you can download the PS-SPEC software. Be sure to register first if you have not done so already.